Unlike some of China’s biggest cities, Shanghai was never a dynasty capital, nor has it been a place of religious importance. In fact, although the city has been inhabited for thousands of years, it wasn’t until the 19th century that it was declared a treaty port by the British and the population exploded. The following decades saw the city grow into an integral industrial and trade hub, both for the east of China and Asia as a whole. 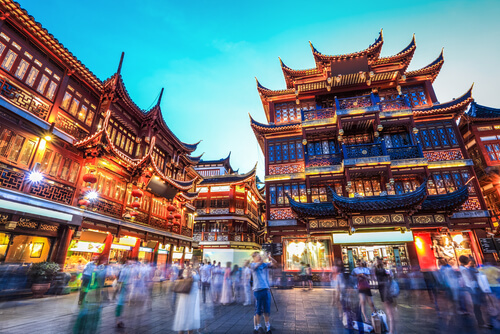 Today, China’s most international city is home to over 24 million people. Shanghai — often referred to as the ‘Paris of the East’ — is known globally as a cultural and economic powerhouse. It is China’s leading city for manufacturing and, since 1990, is home to the country’s largest stock exchange. A wander down Nanjing Road, Shanghai’s main boulevard, is a feast for the senses - from tastes and smells, to sights and sounds, a buzzing energy radiates from every corner. Get your bearings with a 5.5 km ride on the world’s oldest trolley car system, the Dangdang sightseeing tram. History buffs will be captivated by the opulent temples and buildings that dot the streets, while those seeking to discover the city’s contemporary side won’t be disappointed by bold skyscrapers and neon billboards. In the mid 1800s Shanghai was Asia’s most modern city and a most desirable place to be. When the first Opium war ended in 1842, the US, French, British and Japanese governments established territories in Shanghai. As a result, Shanghai’s architecture is a mix of both Chinese buildings, and elaborate art-deco and colonial buildings which wouldn’t look out of place on a Parisian street. The city is broken into 14 districts, each offering very different experiences. The former French Concession area is perhaps the most charming, while those seeking a fusion of the modern and traditional best head to the Bund. 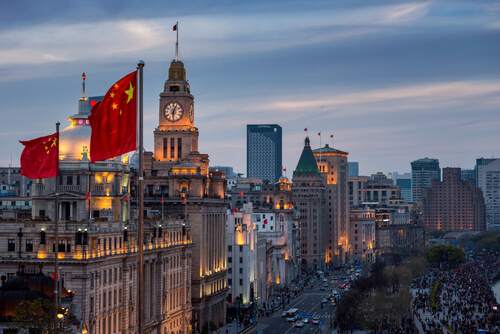 Packed full of food stands, stalls and entertainers, the Bund offers the best views of the city skyline and is a constant hive of activity with an electric atmosphere. Instead of walking along the promenade, leave the crowd behind and take a boat ride on the Huangpu River and view the city from a different perspective. Shanghai is also known for its vibrant art scene – Shanghai Bowuguan (Shanghai Museum) is a treasure trove of over 120,000 items dating back to Chinese antiquity. It’s free to enter and English translations accompany most exhibits. Yuyuan (Yu Garden) is a classical garden dating back to the Ming dynasty. Although small in size, this 400-plus-year-old garden contains all the elements of a traditional Chinese garden: pavilions, halls, rockeries, ponds and cloisters.